Bill is called "resort witch" because he is the father of more than 200 luxury resorts around the world, Hotel de la Coupole in Sa Pa is one of them. Karl Lagerfeld - who was dubbed the "silver-haired king" in the fashion village, is always known for his crazy-invested shows. At one point he set up a giant lion statue standing guard on the pearl at the center of the stage, sometimes he turned the catwalk into a NASA center, where a rocket launcher was reserved for astronauts. .. If Karl Lagerfeld is revered as a fashion village saint, Bill Bensley is "Karl of architecture". The similarity between these two cult characters is storytelling, and any of their creations is upgraded to the artistic level. Bill Bensley has 3 proud works in Vietnam: InterContinental Danang Sun Peninsula Resort in Danang, Hotel de la Coupole in Sa Pa, and JW Marriott Phu Quoc Emerald Bay in Phu Quoc. All 3 works are a combination of Bill and Sun Group - Reputable group in resort, entertainment and entertainment industry in Vietnam. Many of his architectural works tell stories of fashion, adorned with creativity of silk, brocade, sewing thread, sewing machine ... Hotel de la Coupole MGallery by Sofitel is an example lively for the "fashion eye" of Bill Bensley. Beauty enthusiasts will be captivated by Hotel de la Coupole MGallery by Sofitel from the lobby area. This is the place to be dedicated to the young French girls who are full of ways and fascinated with silk dresses. Inspired by lavish fashion shops in Paris, with antique chests, bobbins, mannequins, sparkling dresses, tribal motifs, fur coats, drawers towering with 500 rolls just too large ... the lobby area of the hotel reminds people to remember the fashion streets in magnificent Paris in the 90s. Meanwhile, Chic restaurant was designed by Bill Bensley exactly like a fashion catwalk. Bill divided the restaurant into two areas and separated by an impressive catwalk with two display lights along the T floor. Bill loved the magnificent French beauty, but he was also mesmerized by the wild beauty of the northwestern mountains, so all 249 hotel rooms were dressed in vivid patterns of the highlands. He wanted to tell the story of the French life between the Sa Pa tribes in the years 1920-1930. The story is portrayed by thousands of fashion paintings, typical motifs of each ethnic H'Mong, Dao, Xa Pho, Tay, Giay ... silver decoration accessories on the young girl's head hat highlands, and lots of antiques that Bill has collected from around the world. Even somewhere in this hotel, people still come across a few writings of Coco Chanel. 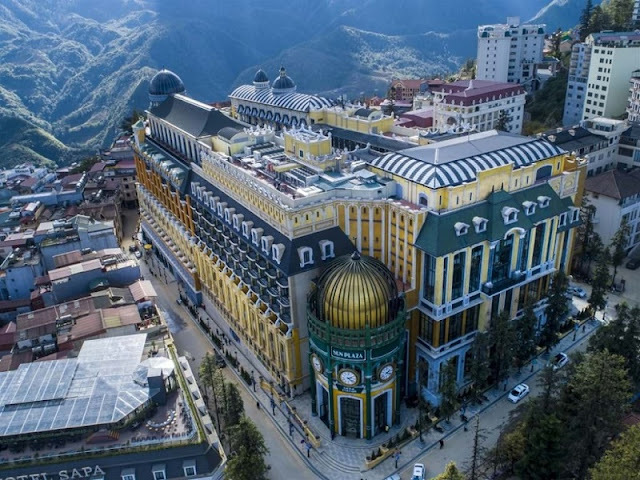 Although all are fictional, it is undeniable that Bill wanted to turn Hotel de la Coupole into a "rendezvous of world-famous designers", between faded Sapa. Seeing a new work in the remote highlands of Bill Bensley, you'll see Versailles - Europe's most glorious palace by its massive size, sophisticated architecture and lavish layout and inscriptions, mark the artistic essence of ancient France. Bill's feelings about Hotel de la Coupole are the same, and this is reflected in the smallest corners of the hotel. Evidence is that wherever you will also see arch-shaped windows, huge chandeliers, and vividly colored French ceiling tiles - classic symbols that you can admire at Versaille palace. In hotel rooms, basic French principles of color - pink, green, and blue are used. The borders, wooden panels, thousands of fashion paintings framed on the wall, the imprint of France has every corner of the hotel. But in the shape of "the most luxurious palace in Europe", there is a pure Northwest soul. Lampshades carry the head scarf of the highland girl. Brocade motifs on high walls, on sofas, on the bottom of a hot water pool ... A small ring of bell hanging on the ceiling as if to ring out typical sounds on the countryside. With the Hotel de la Coupole MGallery by Sofitel, Bill created a sumptuous symbol of France but brought the Northwestern soul, between Sa Pa town - once a French summer vacation paradise.